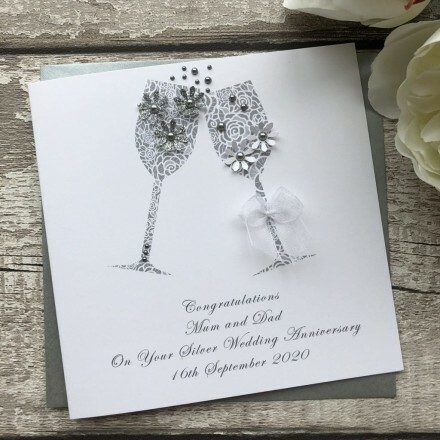 Our great selection of unique handmade silver wedding anniversary cards are the perfect way to convey your best wishes to the couple who have reached another anniversary milestone. All of our Anniversary cards can be personalised on the front and inside to make your card as personal as you wish. This lovely handmade anniversary card is the ideal choice for a married couple to convey your very best wishes for their special 25 years of celebration as husband and wife. This card features an image of elegant Champagne glasses styled with a smattering of shimmering flowers. This handmade wedding anniversary card is teamed with a matching square envelope, protected in a sealed cellophane bag and sent to you in a double board outer envelope to ensure it arrives in pristine condition.